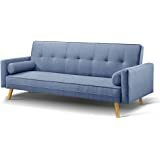 【2 in 1 Use】Beyond the traditional sofa, which offers you a seat only, our 3 seater sofa is more functional, simply pull out the part under the seat to easily turn it into a Queen size bed as well. 【Sturdy Structure】Constructed from anti-shrink and swell-resistant pine wood base that can hold up to 280kg weight capacity for a reliability, stability, and durability. 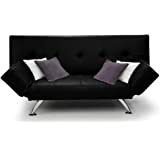 【Soft & Comfortable】Upholstered in breathable faux linen fabric cover with curved padded armrest to gaurantee you an ultimate soft and comfortable sofa bed. 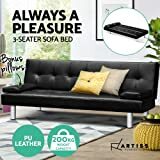 【Adjustable Backrest】Designed with 3 adjustable angles to allow you choose your preferred position for TV watching, cellphone playing, reading or sleeping. 【Thoughtful Design】Comes with 2 cup holders on both armrests for a handy use and side pockets for an easy storage of books, magazines, remote control and so on. What isbetter than having a couch that can be a sofa bed at any time. It issimply space saving and practical when you have guests sleep over or simply want to take a nap at the living room. Simply pull out and convert it into a bed. 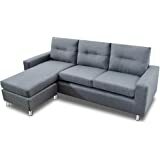 Designed with 3 adjustable position, you can have a reclined or a flat bed. Great for watching a movie as well whenever you want to. 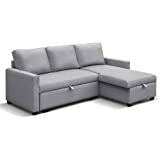 Comes with cup holders on both side, you will have a drink ready nearby when you are watching TV or reading a book on the couch. Store your magazines or Kindle on the side for reading anytime. 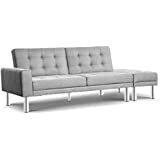 For added comfort, this sofa bed has curved padded armrest that allows you to rest on with comfort. Purchase now for a prompt delivery. 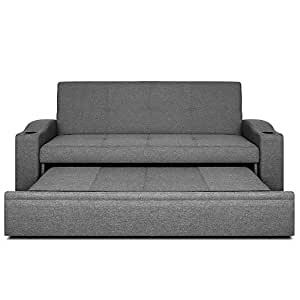 Get this sturdy, comfortable and convertible couch now.